I met Kim from My Pretty Little Tea Party a couple of months back. She is a bespoke children’s event organiser, and as soon as I saw her work I told her that I wanted to work with her. I was so happy to receive her request to document a Unicorn children’s party. The event was held in Hadlow Manor on Sunday just gone and was AMAZING! When I arrived the room already looked stunning. 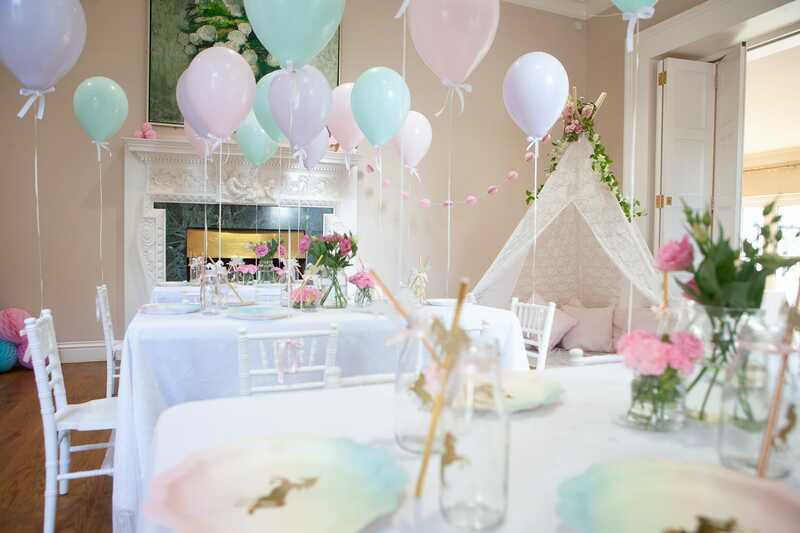 Dressed with beautiful pastel coloured balloons, unicorn glass milk bottles with gold straws, flowers on every table and a lace teepee in the corner. The cake table, was adorned with unicorn cupcakes, a vintage drinks dispenser, the most delicious looking Unicorn cake. Around the room there were unicorns, a facepainter setting up in the other room, and a coffee area for the parents that overlooked the main room. It made me wish that I was 5 again. I would have loved to have a party like this one. After photographing all the details, I stayed on to photograph the party itself. I’ll let you into a secret. I love photographing children’s parties! I love documenting the event from start to finish. Seeing the joyous amazement when the party girl arrives to see the venue in all its glory is wonderful. I adore capturing the keen arrivals, and watching them play all the popular party games that we loved in our own childhood. This particular party had a very special guest: A unicorn princess. This Unicorn princess arrived in all her glory was very much the highlight. She had them singing, dancing, captivated by magic and by the end, hugging her. They begged her never to leave. She really was a delight. The birthday girl had a wonderful time, her friends all had a wonderful time, and her behaved perfectly well through out. I am looking forward to going through my edits and presenting the event organiser a selection of images that will show off her talents and skill as a children’s party organser. Also I cannot wait to meet up with the parents of this lucky little girl and show them the photos. The day was truly magical and I trust they the images will provide a fond memory of a special day.